Living entities process information in very different ways than existing human-made objects, the former excel at having a built-in capability for self-reproduction, self-construction, evolvability, self-organization scalability, adaptability and robustness. We propose using evolving living technologies as an analog computer that combines the computation of molecular interactions in living cells with the programmable manufacturing of molecules. We have created a prototype general-purpose programmable evolution machine towards the purpose of creating designer biomolecules with desired activities by using as input: i) A (new type of) computer program specifying the instructions needed to build a new biomolecule with given properties and ii) Raw materials (e.g. chemical consumables, cell lines, etc). When compiled and after execution, an evolutionary algorithm transforms the raw inputs in the form of target molecules and genetic information for selection into an evolved output – biomolecules with specific activity. This way, just as conventional computers are programmed to carry out arithmetic or logical operations on variables, our device will be programmed to carry out logical operations inside living cells using DNA as a variable. To design functional molecules we use re-engineered bacteriophages (phages) replicating in bioreactors supplied with mixed bacterial populations. Protocols developed for the EVOPROG machine mimic optimization algorithms. Despite recent advances in in vivo directed evolution techniques and the interest they have attracted so far, their impact in applied biotechnology is limited because of their limitations in programmability, selective drivers, cost and scalability – our work aimed at developing enabling technology to overcome these issues. Our technology involves the integration of (i) new programmable fluidic devices growing bacteria, (ii) phages that produce novel biomolecules for biotechnology and medicine and (iii) state-of-the-art combinatorial evolution/selection algorithms executed in living matter. The device we constructed uses existing phage technology and synthetic regulation to engineer a programmable directed evolution machine able to produce biomolecules with novel functionality faster than conventional techniques. We have engineered novel genetic devices for phage engineering, mutation, recombination and selection. In addition, we developed: i) fluidic modules for cell and phage growth, ii) their necessary hardware, iii) a custom instruction set architecture, and iv) high-level language with its own compiler. We have demonstrated the operation of our device by engineering biomolecules in our prototypes, using the experience gained throughout their use towards continued improvement of the platform. We have also developed a prototypical application for bacterial computing relying on the use of DNA as a signal. This is a foundational step towards the development of approaches for a living technology that will impact ICT as well as many areas beyond, such as biology, chemistry and manufacturing. Our phage-assisted evolution system implemented consists of an engineered strain of the bacterium E. coli infectable with selection phages encoding the desired target gene to be evolved. After infection, only a protein or gene circuit with desired properties promotes an expression of a phage gene that is essential for infectious phage production. If such characteristics do not meet the programmed criteria, the essential gene is not expressed and such phages are eliminated from the system being diluted away from the bioreactor. Our evolutionary platform relies on programmable fluidic systems. A modular bioreactor system was developed with the aim to facilitate its deployment in a biological lab setting, in a cost effective way. The solution was also developed towards the generalised use of continuous culture of several microorganism in controllable conditions. The consortium worked on fluidic, hardware and biology layers, to integrate the i) molecular biology and multicellular computing levels (sythetic genetic circuits) ii) bioprocess engineering (developing an integrated arrays of bioreactors for phages), iii) millifluidics (development of programmable switchable valves to operate programmable bioreactor arrays) and iv) the directed evolution system (operating the whole system). We have also considered current issues such as standardization and experimental reproducibility. Our platform includes software designed towards the general standardization of protocols and their automation across automation platforms - using a biology protocol described at a high level of abstraction that is converted to low level instructions automatically and verified against limitations of the existing hardware. This will ensure that the user (biologist/biotechnologist) can focus on the design and specification of the biological protocol and specifications of the desired outcome, whilst skipping all the details on running a directed evolution protocol on a fluidic array. Our evolutionary platform allows engineering both proteins and RNA with novel functions and as a proof-of-concept we have engineered a set of orthogonal transcription factors activating gene expression, which we have published the results. Parallel evolution experiments in the new bioreactor system to test the system. We have been testing the new generation of our bioreactors to establish the evolution scope in independent bioreactors. The run parameters during this parallelized experiment were consistent across the array of bioreactors. The success of the evolution is confirmed by an independent re-occurrence of mutations that fall into a cluster. for evolution experiments a parallelized run delivered new phages that they replicate at high rates in the presence of low amount of the conditionally expressed gene. The EVOPROG machine can also implement programs where the computation takes place outside the cell, which does not rely on gene expression. This is done by re-engineering the phage adsorption. The development of the fluidic processor involves designing, constructing and testing a 3D printed fluidic system for EVOPROG prototype. Collaborative engineering across the Evoprog consortium resulted in the 3D-printed systems that enable parallelized liquid handling for evolution experiment operated in the EVOPROG machine. Through our work, we have designed and agreed on a specification for a parallelized functional EVOPROG system. The currently tested system accommodates two phage reactors and 10 chemostat/turbidostat systems with E.coli cells carrying different types of genes for phage-assisted directed evolution. Specialized device for the system includes 3D printed 3-way and 6-way valve assembly for parallelization of fluid control. The valves have been tested for operation and software compatibility to confirm the correct operation when embedded in EVOPROG machine. Fact: the description of biology protocols (and in particular, directed evolution protocols) is usually ambiguous and incomplete. Problem: Many published protocols are executed manually and are not reproducible in other labs. It is beyond of the expertise of many biologists to design and run an array of multi-modular fluidic devices. Solution: A programming language for molecular biology protocols that is able to describe in a precise way the biological steps of a directed evolution experiment. Advantages of the code include standardization and automation: a biology protocol described using a programming language is easily analysed for correctness and debugging and its execution can be automatized in a robotic/fluidic platform. This will ensure that the user (biologist/biotechnologist) can focus on the design and specification of the biological protocol and specifications of the desired outcome, whilst skipping all the details on running a directed evolution protocol on a fluidic array. An ultimate test of our integration of hardware, software and biology will be the development of multi-sensing bacterial strains to respond in a pre-programmed way to multi-signal environment in bioreactors (multicellular computing). As a proof of concept a phage-based logic game is in the process of implementation to be operated in the EVOPROG machine. 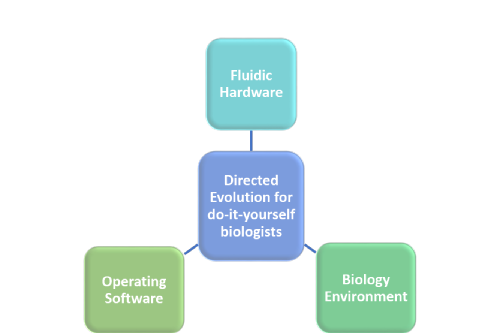 In summary, the success of Evoprog consortium will bring an unparalleled machine integrating biology, fluidic hardware and software solutions to enable programming diverse evolution experiments. As result, novel biologicals for medicine, biotechnology and academia will be generated faster, with better reproducible outcome. Our Evoprog machine is modular and allows to run complex biological experiments including directed evolution, targeted genome engineering, and many others. 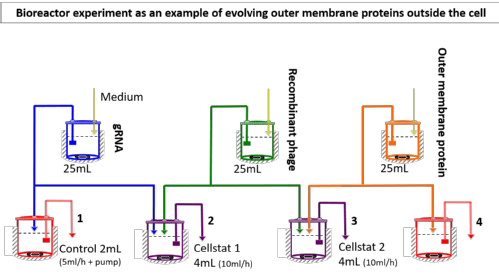 (a) CAD design of the T-junction device with one aqueous input, one oil input, and an output. Internal channel structures are illustrated in blue. Aqueous phase (indicated in blue in the inset) was introduced from the top inlet and oil phase (white) from the left. (b) The CAD design of 3D droplet generator. Aqueous phase (blue in the inset) was cut into small droplets by oil phase (white). (c) Microscopic pictures of generated droplets. Flow rates of aqueous phase are 0.4, 0.8, 1.6, and 2.4 ml/min (top to bottom). 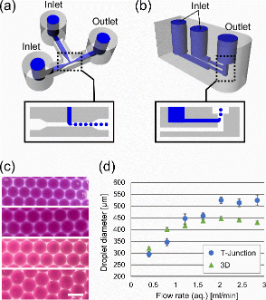 The top two images were from the 3D device, and the bottom ones were from the T-junction device. Scale bar: 250 µm. (d) Plot of droplet diameter as a function of the flow rate of aqueous phase. The flow rate of oil phase was fixed at 2.8 ml/min. Error bars were standard deviations. (a) A schematic diagram of 3D printed micro cell culture system. Fresh growth media (red) are supplied to each cell culture vial every time readings from LED/photodiode sensor pair (corresponding to optical density (OD) of bacterial cell culture) exceed a threshold level(turbidostat operation). The system is parallelized using 6-way valve to distribute cell culture media to up to 6 culture vials. (b) A photograph of 3D printed micro continuous cell culture systems. The holders (black) for cell culture vials, which also works as LED/sensor holder, were printed in Connex500 3D printer (Stratasys).